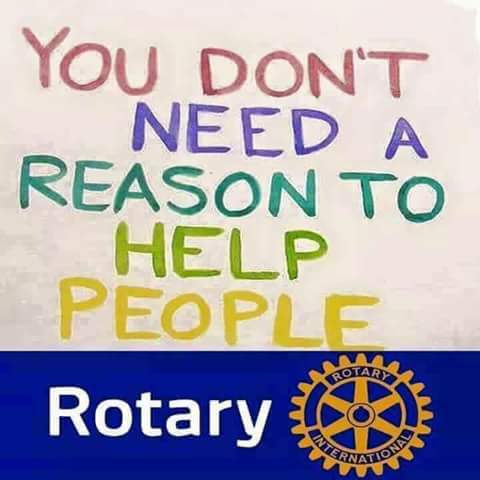 Rotary International is an international service organization whose stated purpose is to bring together business and professional leaders in order to provide humanitarian services, encourage high ethical standards in all vocations, and help build goodwill and peace in the world. It is a secular organization open to all persons regardless of race, color, creed, religion, gender, or political preference. There are 34,282 clubs and over 1.2 million members worldwide. The members of Rotary Clubs are known as Rotarians. Members usually meet weekly for breakfast, lunch or dinner, which is a social event as well as an opportunity to organize work on their service goals. Rotary's primary motto is "Service Above Self"; a secondary motto, "One profits most who serves best". The first Rotary Club was formed when attorney Paul P. Harris called together a meeting of three business acquaintances in downtown Chicago, at Harris' friend Gustave E. Loehr's office in the Unity Building on Dearborn Street on February 23, 1905. 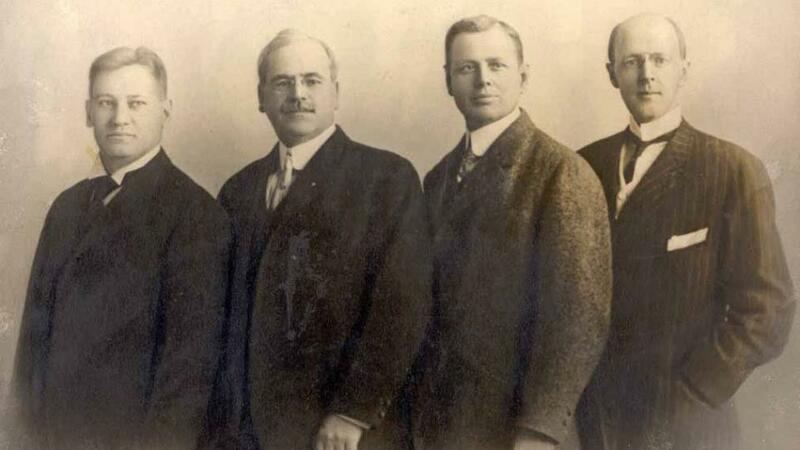 In addition to Harris and Loehr (a mining engineer and freemason), Silvester Schiele (a coal merchant), and Hiram E. Shorey (a tailor) were the other two who attended this first meeting. The members chose the name Rotary because initially they rotated subsequent weekly club meetings to each other's offices, although within a year, the Chicago club became so large it became necessary to adopt the now-common practice of a regular meeting place. The next four Rotary Clubs were organized in cities in the western United States, beginning with San Francisco, then Oakland, Los Angeles, and Seattle. The National Association of Rotary Clubs in America was formed in 1910. On 22 February 1911, the first meeting of the Rotary Club Dublin was held in Dublin, Ireland. This was the first club established outside of North America. In April 1912, Rotary chartered a club in Winnipeg, Manitoba, Canada, marking the first establishment of an American-style service club outside the United States. To reflect the addition of a club outside of the United States, the name was changed to the International Association of Rotary Clubs in 1912. In August 1912, the Rotary Club of London received its charter from the Association, marking the first acknowledged Rotary club outside North America. It later became known that the Dublin club in Ireland was organized before the London club, but the Dublin club did not receive its charter until after the London club was chartered. During World War I, Rotary in Britain increased from 9 to 22 clubs, and other early clubs in other nations included those in Cuba in 1916, Philippines in 1919 and India in 1920. In order to carry out its service programs, Rotary is structured in club, district and international levels. Rotarians are members of their clubs. The clubs are chartered by the global organisation Rotary International (RI) headquartered in Evanston, Illinois. For administrative purposes, the more than 32,000 clubs worldwide are grouped into 529 districts, and the districts into 34 zones. Each club elects its own president and officers among its active members for a one-year term. The clubs enjoy considerable autonomy within the framework of the standard constitution and the constitution and bylaws of Rotary International. The governing body of the club is the Club Board, consisting of the club president (who serves as the Board chairman), a president-elect, club secretary, club treasurer, and several Club Board directors, including the immediate past president and the President Elect. The president usually appoints the directors to serve as chairs of the major club committees, including those responsible for club service, vocational service, community service, youth service, and international service. Honorary membership is given by election of a Rotary Club to people who have distinguished themselves by meritorious service in the furtherance of Rotary ideals. Honorary membership is conferred only in exceptional cases. Honorary members are exempt from the payment of admission fees and dues. They have no voting privileges and are not eligible to hold any office in their club. Honorary membership is time limited and terminates automatically at the end of the term, usually one year. It may be extended for an additional period or may also be revoked at any time. Examples of honorary members are heads of state or former heads of state, famous scientists or other famous people. RYLA, or Rotary Youth Leadership Awards is a leadership program for young people aged 14 to 30 across the globe that aims to unite and provide resources for future leaders. Rotaract: a service club for young men and women aged 18 to 30 with around 215,000 members in 9,388 clubs in 176 countries. Rotaract was founded in 1968 by Charlotte North Rotary Club, located in Charlotte, North Carolina, USA. Rotaract clubs are either community or university based, and they are sponsored by a local Rotary club. This makes them true "partners in service" and key members of the family of Rotary. ARYLA, or Advanced Rotary Youth Leadership Awards is a leadership conference for youth, ages 19 to 29, across the globe that focuses on business and leadership skills. ARYLA aims to build upon the skills of recognized youth leaders to motivate and enable them to begin service projects. The ARYLA New England branch runs a conference every year in late July out of Norwalk, CT. The most notable current global project, PolioPlus, is contributing to the global eradication of polio. Sergio Mulitsch di Palmenberg (1923–1987), Governor of RI District 204 (1984–1985), founder of the RC of Treviglio and Pianura Bergamasca (Italy), was the man who inspired and promoted the RI PolioPlus vaccination campaign. Mulitsch made it possible shipping the first 500,000 doses of antipolio vaccine to the Philippines at the beginning of 1980. This project later gave rise to the NGO “Nuovi Spazi al Servire” co-ordinated by Luciano Ravaglia (RC Forlì, Italy). Since beginning the project in 1985, Rotarians have contributed over US$850 million and hundreds of thousands of volunteer-hours, leading to the inoculation of more than two billion of the world's children. Inspired by Rotary's commitment, the World Health Organization (WHO) passed a resolution in 1988 to eradicate polio by 2000. Now a partner in the Global Polio Eradication Initiative (GPEI) with WHO, UNICEF and the U.S. Centers for Disease Control and Prevention, Rotary is recognized by the United Nations as the key private partner in the eradication effort. "We know that it’s a formidable challenge to eradicate a disease that has killed and crippled children since at least the time of the ancient Egyptians. We don’t know exactly when the last child will be affected. But we do have the vaccines to wipe it out. Countries do have the will to deploy all the tools at their disposal. If we all have the fortitude to see this effort through to the end, then we will eradicate polio." Some of Rotary's most visible programs include Rotary Youth Exchange, a student exchange program for students in secondary education, and the Rotary Foundation's oldest program, Ambassadorial Scholarships. Today, there are six different types of Rotary Scholarships. More than 38,000 men and women from 100 nations have studied abroad under the auspices of Ambassadorial Scholarship, and today it is the world's largest privately funded international scholarships program. In 2006-07 grants totaling approximately US$15 million were used to award some 800 scholarships to recipients from 69 countries who studied in 64 nations. The Exchange Students of Rotary Club Munich International publish their experiences on a regular basis on Rotary Youth Exchange with Germany. In July 2009 the Rotary Foundation ended funding for the Cultural and Multi-Year Ambassadorial Scholarships as well as Rotary Grants for University Teachers. Rotary Fellowships, paid by the foundation launched in honor of Paul Harris in 1947, specialize in providing graduate fellowships around the world, usually in countries other than their own in order to provide international exposure and experience to the recipient. Recently, a new program was established known as the Rotary peace and Conflict Resolution program which provides funds for two years of graduate study in one of eight universities around the world. Rotary is naming about seventy five of these scholars each year. The applications for these scholarships are found on line but each application must be endorsed by a local Rotary Club. Children and other close relatives of Rotarians are not eligible. Rotary clubs worldwide place a focus on increasing literacy. Such importance has been placed on literacy that Rotary International has created a “Rotary Literacy Month” that takes place during the month of March. Rotary clubs also aim to conduct many literacy events during the week of September 8, which is International Literacy Day. Some Rotary clubs raise funds for schools and other literacy organizations. Many clubs take part in a reading program called "Rotary Readers," in which a Rotary member spends time in a classroom with a designated student, and reads one-on-one with them. Some Rotary clubs participate in book donations, both locally and internationally. As well as participating in book donations and literacy events, there are educational titles written about Rotary Clubs and members, such as Rotary Clubs Help People and Carol is a Rotarian by Rotarian and children's book author Bruce Larkin.